America’s Abortion “Choice” – Will We Let a Fraudulent Alibi Justify Murdering Even More Babies for Profit? When he died at 101 years old, David Rockefeller held the world record— and still does — for having more heart transplants — seven — than any other human being who has ever existed. If he could, he might tell us the market for body parts is big business. But then … some people at places like Planned Parenthood already know it. In 2015, one PP executive was even videotaped joking about selling baby organs to get a Lamborghini. But was she really joking? In a separate video from 2014, PP’s Senior Director of Medical Services can be seen openly discussing how improved abortion techniques were allowing organs to be preserved during the abortion process with an eye towards later sale. According to Snopes, PP has denied any profiteering in the market of butchering babies for their body parts. That would be immoral … wouldn’t it? How much PP actually receives for the “specimens” they sell — err, “donate to medical research at cost” — only PP knows. One thing is for sure, however. It is a market where demand far exceeds supply, which suggests that the price an organization like PPcouldobtain for such “specimens” a lot more than mere chump change. That is… were any such group ever inclined to want to “profit” from such an enterprise. But they don’t. PP said so. It is to our shame as a nation that we complied. By doing so, the selling of aborted baby body parts in America, for all practical purposes, soon became even more “normalized” than it already was. And that, in turn, brings us to where we find ourselves today. On January 22ndof this year — the 44thAnniversary of Roe v. Wade — America witnessed a standing-room-only crowd jammed in the chamber of the Democrat-controlled New York state legislature cheering and applauding the passage of the fraudulently mislabeled legislation —The Reproductive Health Act. For all practical purposes, it legalized the “harvesting” of baby parts from infants that can now be killed by abortionists at any time up to the very moment of their birth. The question is … WHY, in the context of any culture that would even hope to lay claim to being civilized, would any group of people even imagine proposing the passage of such a law that, on its face, is so clearly evil? Witness the vocal proponents of New York’s legislation — including Governor Cuomo —who are telling everyone willing to listen that a woman’s decision to kill her child in the third trimester is necessary to “protect the right of women to choose.” And the marketing of this noble sounding ideal is picking up steam. Virginia, Alaska, New Jersey, Oregon, Colorado, New Hampshire, Vermont, California, and New Mexico are already beating the drums. If these states do not already allow late-term abortions, they very soon might. And, sadly, others are sure to follow. Regardless of their arguments centered around this “right,” however, America should be clear on one point before it continues to follow the Left down this rabbit hole. This alibi offered by the Left to excuse the legalization of murder is a fraud. In other words, to say this legislation is all about “choice” is a lie. That “right” has already been afforded ample protection ever since Roe v. Wade was decided 44 years ago. From this, the question arises: If the pretext being offered the public to justify it is really only an ideological mirage, what then is the real end the abortion industry is hoping to achieve that they feel must be hidden from the public behind this illusion? Perhaps the bromide “follow the money” should be brought to bear. Might the real motivation of some pushing this legislation be their hope to legalize their access to an increased supply of body parts that, in turn, will allow them to increase their profits? Of course, the abortion industry will deny this is their real game plan all day long and twice on Sunday. In the business of abortion, profiteering from the sale of baby body parts is and always will be a material motive for at least some practitioners, as long as greed remains embedded in the DNA of mankind. The greater tragedy, however, is that America also turned a blind eye to this same truth when it first normalized the industry that gave birth to the lawful selling of baby body parts 44 years ago. Nevertheless, America today appears to be shocked by the abortion industry’s latest demand that third trimester abortions now also be legalized. 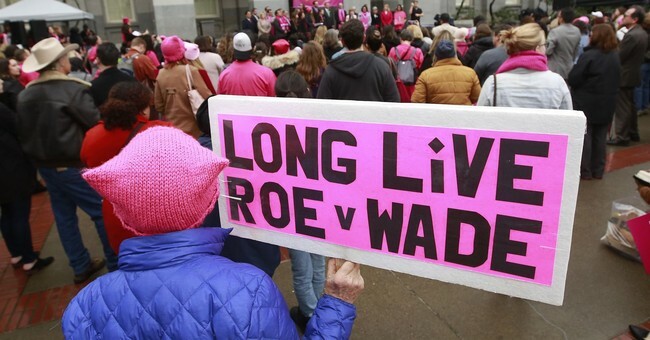 America long ago relinquished its moral authority to declare late-term abortions wrong back when it allowedRoe v Wade to place its stamp of approval on any abortions. ·After all, if a fetus is not a legal “person” until it is born —as abortionists maintain— then what difference should it make in which trimester someone dismembers it to sells the parts? ·Whereas if a fetus in the third trimester is a lawful human being —i.e. “person” —who can be murdered, on what rational basis can that same fetus not also be considered a human being in all trimesters? ·And if a fetus is a human being in all trimesters, late-term abortions cannot be condemned by America unless all abortions in this nation are condemned. Beyond that, it’s all only semantics to be argued by those willing to forfeit their souls to barter with the devil. Such is the Pandora’s Box the Left’s push for late-term abortions has now opened before America. If America is unable to return to the other side of the moral Rubicon it crossed when it first legalized abortion decades ago, we may very well soon find ourselves becoming a nation where people like Kermit Gosnell— rather than going to prison — will be allowed to define for the rest of us who we are as a culture. And if that is the direction America “chooses” to take … may God have mercy on our souls. Clifford C. Nichols is an attorney licensed to practice in California and New Mexico. He is also a political commentator and the author of a recent satire —My Unspeakable Kindergarten Experience with Kavanaugh— that lampoons the Left’s mistreatment of Justice Kavanaugh. Follow him on Twitter at @cnicholslawand direct any comments or questions regarding this editorial to cliff@cnicholslaw.com.